Went in at around 10am, it was already busy with sunday – brunchers… We had to wait for about 15 minutes, so we figured we’d try their coffee while we wait. The staff were friendly, and would with our tough coffee orders. Their coffee is great – a little creamy in their milk, but not enough for me to say that it’s my favourite. Coffee was hot. (needed to have it cooled down before drinking). I prefer hot, but i hear that too hot will not make the coffee be at it’s best? Unfortunately we didn’t get a photo of the coffee, as we were quite hungry by the time. I had the Thick Cut Bacon. A noobie mistake. It was my first time trying thick cut bacon, and I don’t like it. I prefer the crispy thin sliced bacon. I can only comment on the Gruyere potato, chipotle mayo and beetroot relish and poached egg. They were beautiful. My favourite was the beetroot relish – a bit sweeter than I wanted, but really nice. Then came the potato, very soft and full of favour. My other two friends had sweet desserts from the special menu. 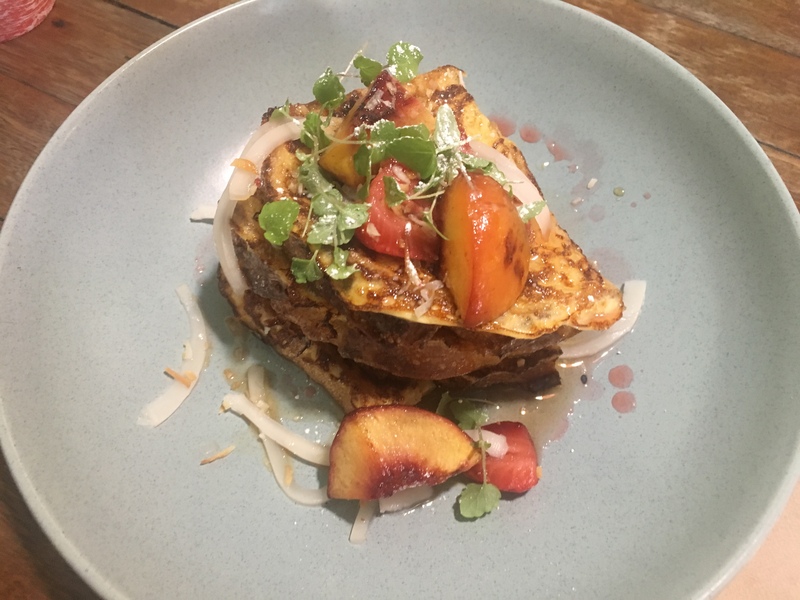 M had peaches on french toast. The toast appeared to be like any other bread but toasted and glazed. From memory I believe egg was also wrapped around it so it balanced the sweetened of this dish. It wasn’t as sweet as my other friends pancake dish. R ordered the sweet pancake with berries and the yellow curd was passionfruit. That sauce was amazing. Because everything else was sweet with the syrup, I could keep having the passionfruit curd! The pancake itself was a bit thick for our liking. A bit dense so it was easy to be full from it. We were looking for an airy/fluffy texture. Overall, I’d recommend to go for their food! Pace of service was slightly slower than expected, I thought I had planned OK for my next outing, but it turns out I had to rush back home because we waited for a table and also waited for our food for some time.